Summer BBQ's and Celebrations is a special time to have outdoor parties and invite friends and family over to enjoy your patio and garden. 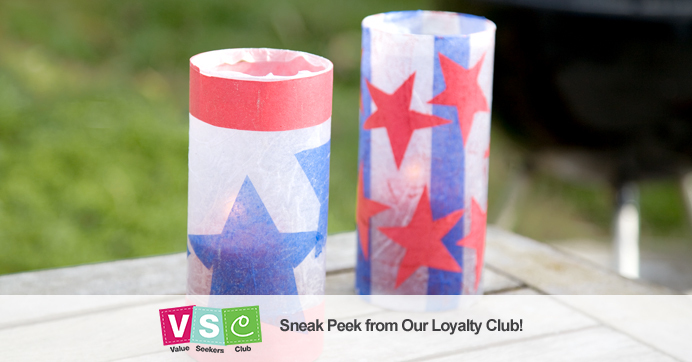 Patriotic outdoor celebrations are a great way to enjoy the summer season and with decorations and craft ideas from the Dollar Tree you can easily create a beautiful patriotic party for your guests to enjoy! There are so many different and easy ways to decorate your home plus make fun and simple crafts using Dollar Tree items, Here are just a few ideas below to get you started..and remember you can order Dollar Tree products online and pick them up in your store for free or have them shipped directly to your home. 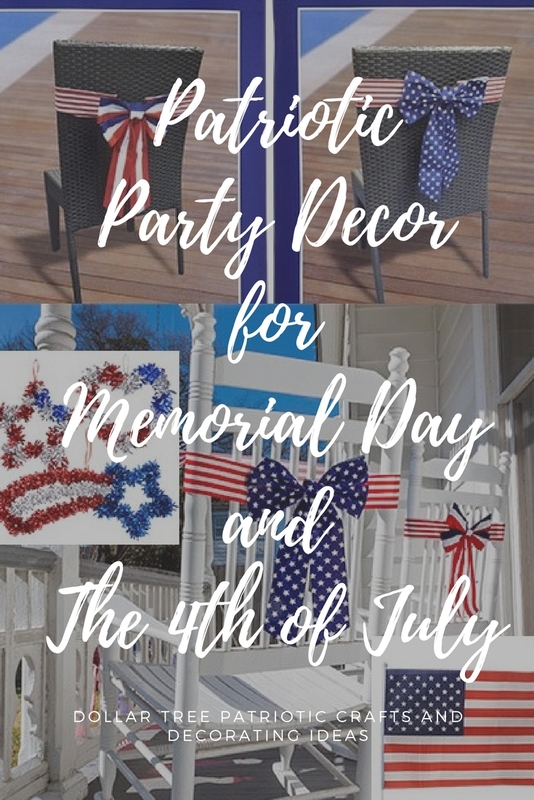 You can easily decorate your home with these fun ideas and get the supplies you need from plates, napkins, balloons, hats, flags and more to use for your outdoor or indoor patriotic celebration! The dollar store is an affordable and one of the best ways to throw a party or create fun and unique crafts. Add some red, white and blue flowers to your centerpieces on your tables or around the patio. There are many ways to decorate with flowers. Flowers are a great way to decorate. Use inexpensive vases, string them along a fence or add them to a wreath. Patriotic Tablecloths are the perfect way to dress up a table for your party. Add a centerpiece on the table cloth and make your party a fun celebration! When it comes to decorating for the holidays you can find all sorts of great items to use from flags to balloons and other decorative items. Explore all Patriotic themed decorations. 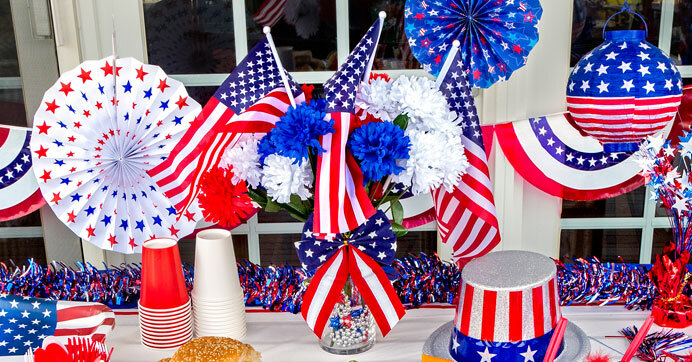 Before your guest enter your party encourage them to get in the patriotic spirit with these red, white and blue items that they can wear to celebrate their love of the flag! You can't go wrong with this patriotic piece of jewelry! Show off your style and be comfortable in a pair of flip flops for the summer! 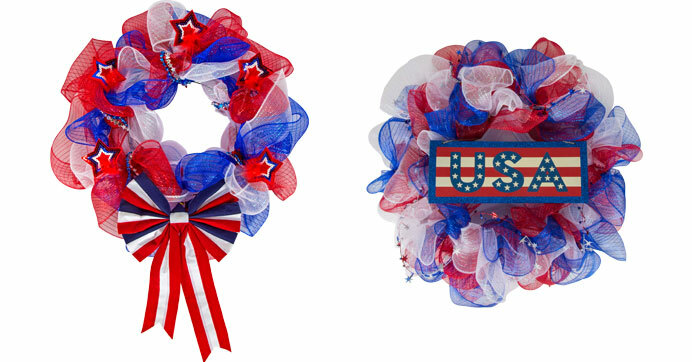 Patriotic Sunglasses, Hats, Jewelry, Scarves, and accessories for your 4th of July Celebration! All sorts of fun things for family and friends to wear ! Party Supplies for the 4th of July! From centerpieces to tablecovers, plates, cups, utensils, napkins, and more in a red, white and blue theme you can easily provide your guest with everything they need without spending a lot of money on party supplies. 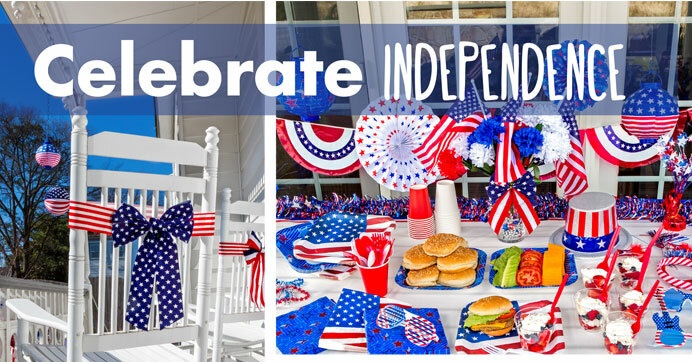 View all Party Supplies in a Red, White, and Blue Theme.